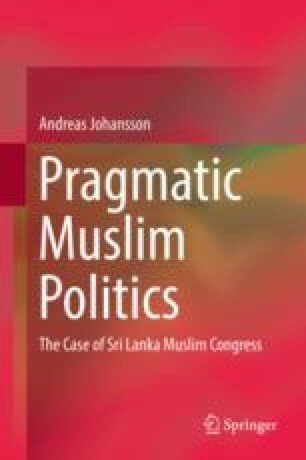 The following chapter analyzes the ideology of the Sri Lanka Muslim Congress as expressed in the official documents of the party. I have divided the chapter depending upon who is the intended recipient of the document. The Constitution of the Sri Lanka Muslim Congress is the party’s written political platform and is directed towards the general public, the government, other political organizations, and members of the party. The document The proposal of the Sri Lanka Muslim Congress and Resolution to the conflict in the northern and eastern provinces: the Muslim dimension can be seen as directed towards the government. Code of Conduct, on the other hand, is a document mainly for internal use. It outlines specific rules for the members of the party. Under the headline “Convention speeches”, documents containing older party convention speeches, for example, Ashraff’s convention speeches and Sri Lanka Muslim Congress 15th Convention are analyzed. These are documents for sale in the party’s headquarters, with the members of the party as the intended audience. In “On the Internet and in public spaces,” the approach by the SLMC elite to the Internet, and also some posters during election time, is examined. These can be seen as directed towards a general public, or potential voters. The last part in this chapter deals with the case of a certain public symbol in the text Signs and Greatness. Rauff Hakeem Facebook page. Retrieved December 11, 2014, from https://www.facebook.com/RauffHakeemOfficial?fref=ts. SLMC “123rd Commemoration Oration of Alhaj Dr T B Jayah”. Retrieved December 3, 2014, from http://slmc.lk/123rd-commemoration-oration-of-alhaj-dr-t-b-jayah/. ——— “A Pen Portrait of Our National Leader – Abdul Rauff Hakeem”. Retrieved December 3, 2014, from http://slmc.lk/leader/leader/. ——— “Colombo district, Facebook page”. Retrieved October 2, 2013, from https://www.facebook.com/groups/251493301572339/?fref=ts. ——— “Dr A.M.A. Azeez birth centenary oration”. Retrieved September 30, 2013, from http://slmc.lk/leader/leaders-orations-2/dr-a-m-a-azeez-birth-centenary-oration/. ——— “Gallery” Retrieved December 3, 2014, from http://slmc.lk/gallary/. ——— “Home”. Retrieved December 2, 2014, from http://slmc.lk/home/. ——— “Inaugural oration at the KC Kamalasabeyson Memorial Lecture”. Retrieved December 3, 2014, from http://slmc.lk/leader/leaders-orations-2/inaugural-oration-at-the-kc-kamalasabeyson-memorial-lecture/. ——— “Keynote Address at the World Muslim Forum”. Retrieved December 3, 2014, from http://slmc.lk/leader/leaders-orations-2/leading-a-minority-muslim-community-a-sri-lankan-experience/. ——— “Leaders poetry”. Retrieved December 3, 2014, from http://slmc.lk/home/leaders-poetry/. ——— “M. Sivasithamparam Commemorative lecture”. Retrieved December 3, 2014, from http://slmc.lk/home/leaders-poetry/. ——— “Our Achievements”. Retrieved December 3, 2014, from http://slmc.lk/about-us/our-achievements/. ——— “Our History”. Retrieved April 2, 2013, from http://slmc.lk/about-us/sri-lanka-muslim-congress/. ——— “Our Objective”. Retrieved September 30, 2013, from http://slmc.lk/about-us/sri-lanka-muslim-congress-2/. ——— “Our Party”. Retrieved September 30, 2013, from http://slmc.lk/about-us/our-objective/. ——— “Our Policy”. Retrieved December 3, 2014, from http://slmc.lk/about-us/our-policy/. ——— “Responsibility to Protect: Asian-African Perspectives”. Retrieved December 11, 2014, from http://slmc.lk/leader/leaders-orations-2/leaders-orations/. ——— “Statement by Minister of Justice and Leader of Sri Lanka Muslim Congress Rauff Hakeem”. Retrieved December 11, 2014, from http://slmc.lk/media/article/statement-by-minister-of-justice-and-leader-of-slmc-rauff-hakeem/. ——— “T B Jayah Commemoration Lecture”. Retrieved December 3, 2014, from http://slmc.lk/news/more-news/t-b-jayah-commemoration-lecture/. Bearman, P. Th. Bianquis, C.E. Bosworth, E. van Donzel, and W.P. Heinrichs. 2006. ʿIlm. Encyclopaedia of Islam, Second Edition. Retrieved March 24, 2016. 2015http://referenceworks.brillonline.com/entries/encyclopaedia-of-islam-2/ilm-SIM_3537. First appeared online: 2012. Bernard, M. 2006. Id̲jmāʿ. Encyclopaedia of Islam, Second Edition. Brill Online. Retrieved January 14, 2015, from http://referenceworks.brillonline.com/entries/encyclopaedia-of-islam-2/id-j-ma-COM_0350. Denny, Frederick Mathewson. 2012. Umma. Encyclopaedia of Islam, Second Edition. Edited by: P. Bearman, Th. Bianquis, C.E. Bosworth, E. van Donzel, W.P. Heinrichs. Brill Online, 2016. Retrieved November 28, 2013, from http://referenceworks.brillonline.com/entries/encyclopaedia-of-islam-2/umma-COM_1291. First appeared online: 2012. ———. 2013. Community and Society in the Qurʾān. Encyclopaedia of the Qurʾān. Brill Online. Retrieved November 28, 2013, from http://referenceworks.brillonline.com/entries/encyclopaedia-of-the-quran/community-and-society-in-the-quran-COM_00037. Graham, William A. 2013. Basmala. Encyclopaedia of Islam, THREE. Brill Online. Retrieved December 19, 2013, from http://referenceworks.brillonline.com/entries/encyclopaedia-of-islam-3/basmala-COM_23497. Hallaq, Wael. 2014. Law and the Qurʾān. Encyclopaedia of the Qurʾān. Brill Online. Retrieved December 2, 2014, from http://referenceworks.brillonline.com/entries/encyclopaedia-of-the-quran/law-and-the-qur-a-n-EQCOM_00106. Hawting, G.R.. 2013. Oaths. Encyclopaedia of the Qurʾān. Brill Online. Retrieved November 20, 2013, from http://referenceworks.brillonline.com/entries/encyclopaedia-of-the-quran/oaths-COM_00138. Lewis, B. 2006. Mas̲h̲wara (a.) or Mas̲h̲ūra. Encyclopaedia of Islam, Second Edition. Brill Online. Retrieved March 2, 2012, from http://referenceworks.brillonline.com/entries/encyclopaedia-of-islam-2/mashwara-SIM_5010. Reinhart A.K.. 2006. S̲h̲ukr. Encyclopaedia of Islam, Second Edition. Brill Online. Retrieved January 16, 2015, from http://referenceworks.brillonline.com/entries/encyclopaedia-of-islam-2/s-h-ukr-COM_1061. Rowson, Everett K. 2014. Gossip. Encyclopaedia of the Qurʾān. Brill Online. Retrieved December 2, 2014, from http://referenceworks.brillonline.com/entries/encyclopaedia-of-the-quran/gossip-EQCOM_00077. Tyan, E. 2012. Bayʿa. Encyclopaedia of Islam, Second Edition. (eds.) Brill Online. Retrieved 24 March 2016 http://referenceworks.brillonline.com/entries/encyclopaedia-of-islam-2/baya-COM_0107. Waines, David. 2013. Tree(s). Encyclopaedia of the Qurʾān. Brill Online. Retrieved November 19, 2013, from http://referenceworks.brillonline.com/entries/encyclopaedia-of-the-quran/tree-s-SIM_00425.